This is a 50 sheet box of 11 x 14" Metallic Satin Printing Paper from Inkpress. This is a unique paper that produces a rich metallic pearlescent surface. It is characterized by an instant dry base that is both water and scratch-resistant. Irrespective of whether you print with Dye, Ultrachrome, Durabrite or HDR inks, this paper will produce vibrant color that displays superior sharpness with a deep black density. 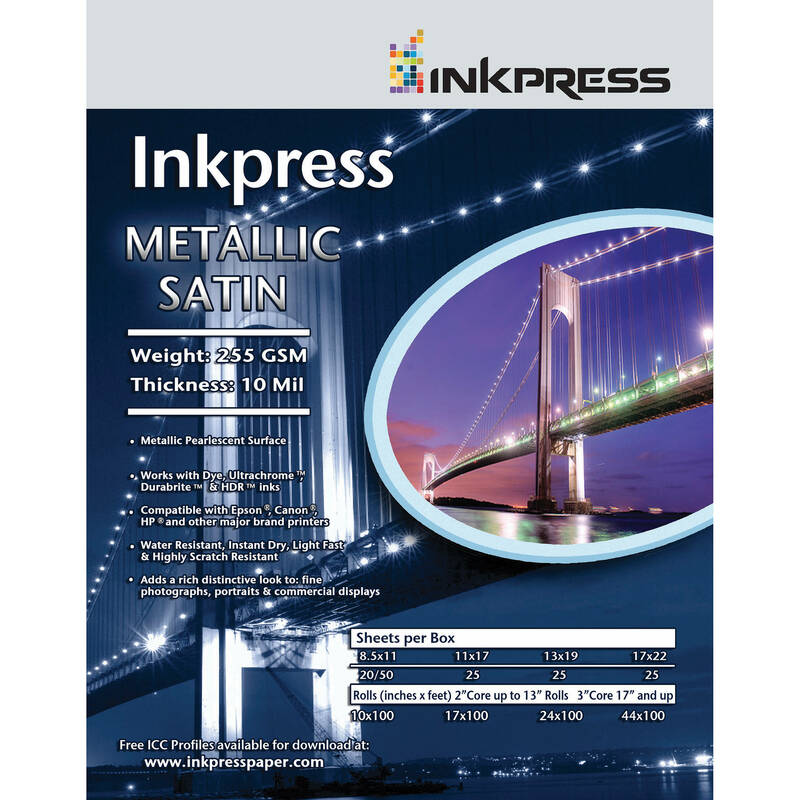 Inkpress Metallic Satin Paper is suitable for fine art, commercial or everyday studio work. Box Dimensions (LxWxH) 14.6 x 11.6 x 0.95"
Metallic Satin Printing Paper (11 x 14", 50 Sheets) is rated 4.5 out of 5 by 2. Rated 4 out of 5 by Dan from Great paper but easily scratched. I use this paper with my Epson 3800. I print both landscape and portrait images on this paper and I am thoroughly impressed with the results. The colors are more vibrant than standard glossy paper and the metallic sheen give my images an almost 3D feel. My clients have all given me positive feedback about the look of their final prints on the metallic paper and I definitely recommend it for those looking to add a little extra pop to their prints. The only issue I have with this paper is it is EASILY scratched. By this I mean I have a couple prints where there are small white dots on the paper from where some of the metallic coating has come off and it becomes quite bothersome if it is located smack dab in the middle of the photo. Other than that, I highly recommend this paper. Rated 5 out of 5 by reg from Best Paper out there! I photograph loads of city and landscapes and printed them using this paper. I remembered using a metallic paper on a large format printer in school and craved that glimmer and some once more. I am VERY pleased with the results as my larger photos were printed on aluminum and these prints replicate that look to the T. I only really work in black and white with a wide range of grays, blacks, and whites, but each tone is enhanced by the metallic satin.